Not all sales are created equal. 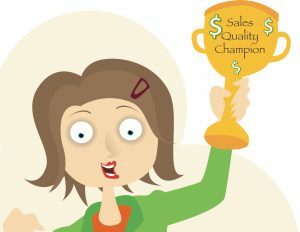 Some sales result from better decision-making quality than others. For example, an insurance company I worked for gave “quality awards” to deserving agents. Agents earning this award consistently sell policies that stay in force a higher percentage of the time. The same agents tend to win this award year after year. These agents are able get their clients both to buy and to buy-in. This is good for the agent, the agency, and the customer. Successful multi-level marketing salespeople don’t just sell products. They also get customers to enlist friends to sell their products. This requires securing a higher level of conviction from customers. These salespeople have mastered the art of obtaining higher decision-making quality. How do they achieve this? It’s simple. They’re able to create buying-decisions customers take personal ownership for. They’ve successfully integrated their client’s beliefs and values with the decision to buy. These salespeople don’t try to instill new beliefs and values in their customers. Through active listening and observation they discover beliefs and values their customers already have. Once these beliefs and values become apparent, salespeople can respond by presenting their product, service, or idea in a complementary way. Traditional sales training under emphasizes the importance of buying-decision quality. It’s short sighted for salespeople to just go for the sale and move on. Most salespeople must rely on their customers taking independent initiative after their salesperson leaves. This initiative could be in the form of re-using the product, re-ordering it, or giving a good review to potential customers. It’s not uncommon for customer follow-through to be more valuable than the initial sale itself. High quality buying-decisions are achieved by clear intention, deep consumer awareness, and insightful salesperson responses. The art of securing high quality buying-decisions is one of the most valuable but understated sales skills a salesperson can possess. More information about coaching customers to make better decisions is available on my website and in my book which is also available in Spanish. Pedro Rubio on Don’t Forget about Conscious Capitalism for Sales Departments!